I watched X-Men 3: The Last Stand just after it was released. As a fan of the X-Men comics, who has watched the previous 2 movies and the animated TV series X-Men Evolution I was hoping for more of the same … but was worried about the change in directors with Brett Ratner replacing Bryan Singer. Unfortunately my fears were realised as Ratner served up a movie littered with special effects, but devoid of character development or a cohesive plot. To make it worse, the movies pace was far to fast, and too much time was wasted introducing dozens of new mutant characters such as Juggernaut (Vinnie Jones) whose acting skills are as subtle as a brick thrown through a window. The end even made a mockery of the film’s title The Last Stand with none too subtle hints after the credits finished rolling that a sequal or spinoff is in the making. In X-MEN: THE LAST STAND, the final chapter in the “X-Men” motion picture trilogy, a “cure” for mutancy threatens to alter the course of history. For the first time, mutants have a choice: retain their uniqueness, though it isolates and alienates them, or give up their powers and become human. The opposing viewpoints of mutant leaders Charles Xavier, who preaches tolerance, and Magneto, who believes in the survival of the fittest, are put to the ultimate test – triggering the war to end all wars. 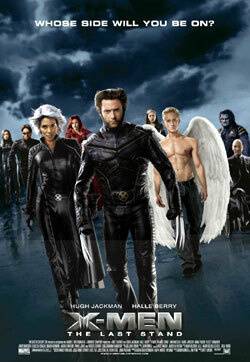 x-men part 1 is best part out of all, but x-men part 3 hae more action i think. I was disappointed with X Men 3. After the terrific X-Men 1, trilogy went downhill. Yes there were great effects in #2 & #3 but the storyline and scripts were seriously poor. Shame but thats how I feel. we had a disagrement… the young boy tht holds th ‘cure’ i was prety sure his power ment no mutent cud go near him without looseing their power.. yh? so th scene where th relli big guy tht cn run thru walls (sorry about my x men termonoligy) trys 2 run thru th wall where th boy is but knocks himself out.. tht happened cus he cudnt use his powers around the boy.. I was bummed out with the last X-Men movie too! The only good part about it was watching Hugh Jackman, dreamy… I had higher expectations for the third film so, hopefully, if they release another one they try a little harder. watched X-Men 3. it was ok. but i had to watch again so i could get the whole story. the subtitles are excelent with my hearing. i can hear if a day (sorry, not Deaf) but of a night, realy hard. they gotta do a forth one. it feels like its not completed.